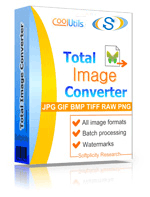 Besides converting JPEG files to various formats, Total Image Converter allows editing original images. You can crop, resize, rotate them, if original formatting doesn't match your needs. You can crop JPEG images in batch with one click. If a group of pictures has the same layout, you can setup the same area for all files instead of cropping each one separately. You need to check off the images you want to edit and click on the "Crop" icon. In order to crop photos in batch just select all the required files at once. You can use either Thumbnails or Details view. After pressing "Crop" you will see a popup window appear. There is a set of options you can adjust. Specify the location for the cropped images and set the borders you want to cut. This is how to crop JPEG files without conversion. If you need to convert selected image fragments into another format, you don't need to run conversion separately from cropping. Check off the sources and press on the icon with the desired format. A settings wizard appears. Go to the "Crop" tab in it and setup margins for cropping. As a result you will get cropped fragments converted into the selected format. 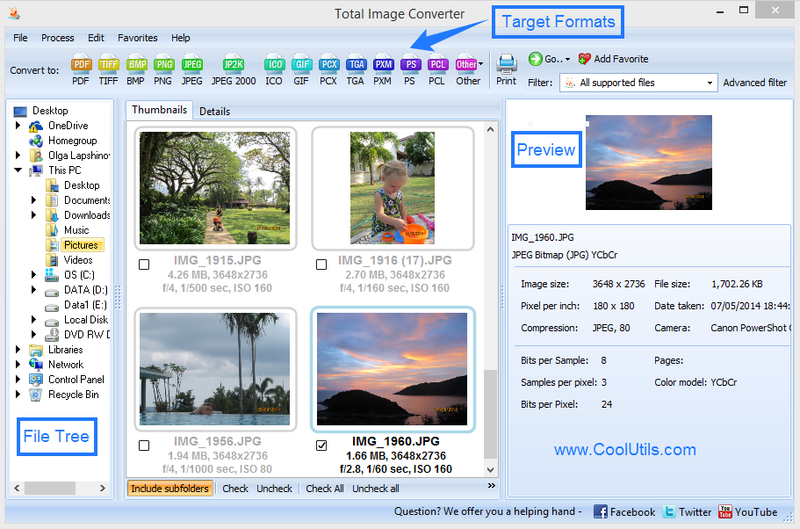 This image converter is developed to make life easier for those who have little time on image processing. With its help you can do both editing and conversion together, and process all the files in one batch. It is an excellent solution for optimizing photos. The interface is very similar to standard image editors, so no new skills are required. 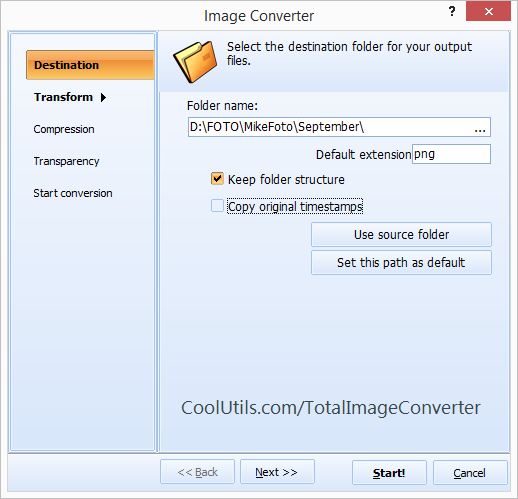 Cropping becomes easy with Total Image Converter, even if you deal with hundreds of images. Try it for free in the trial version!